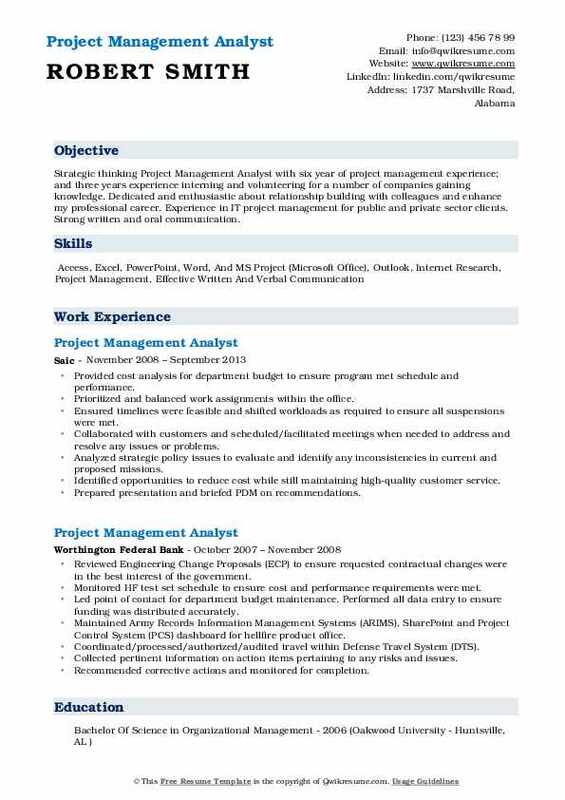 Project Management Analyst basically provides analytical support for the company’s projects. 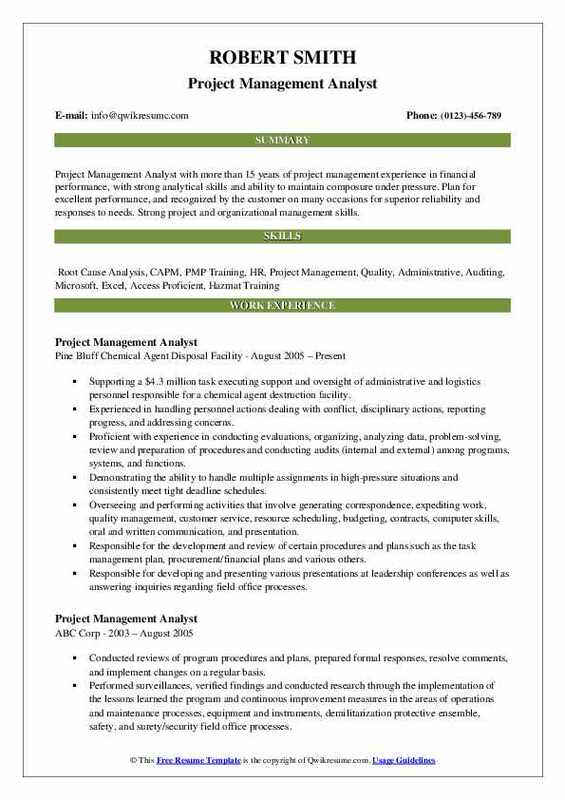 The key roles and responsibilities that falls in the job portfolio of these analysts include – assisting in budget analysis, drafting cost estimates, monitoring fund receipts, ensuring customer satisfaction, preparing monthly and quarterly reports, documentation, monitoring and communicating about project assumptions and key risks to stakeholders and finding critical activities by using CPM – Critical path methodology. 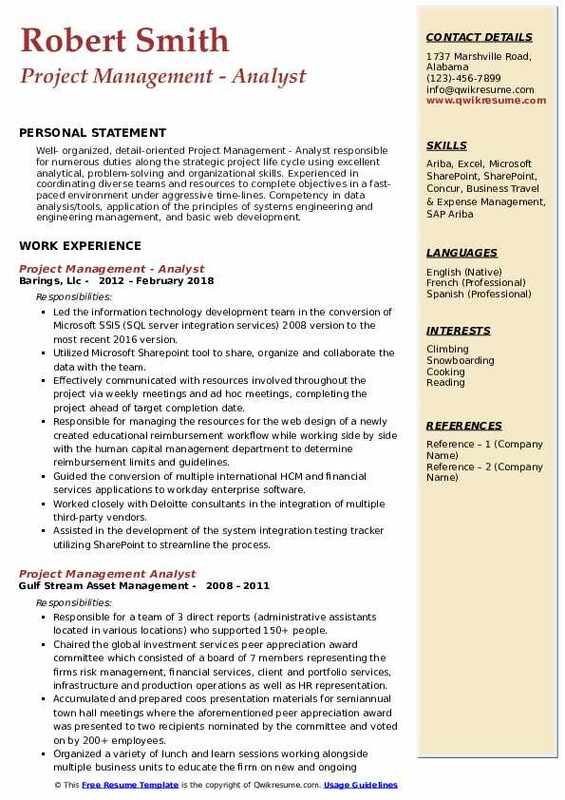 To become a successful Project management analyst, a candidate should have an excellent understanding of SAP project system, SAP work Management system or SAP BW, they are also required to have ample experience in project scheduling or Project planning and control. 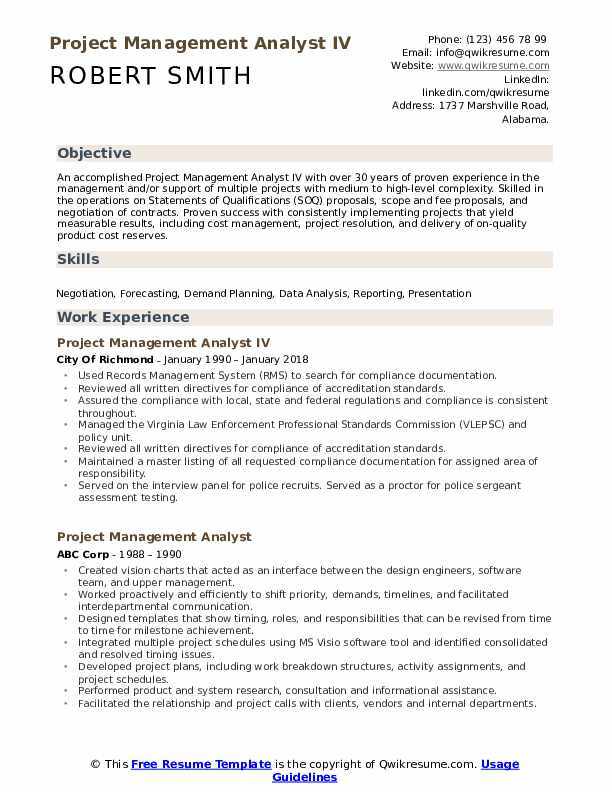 Employers lookout for a Project Management Analyst Resume that portrays a Bachelor’s degree in Business Administration or the related for filling this job position. Summary : An accomplished Project Management Analyst IV with over 30 years of proven experience in the management and/or support of multiple projects with medium to high-level complexity. Skilled in the operations on Statements of Qualifications (SOQ) proposals, scope and fee proposals, and negotiation of contracts. Proven success with consistently implementing projects that yield measurable results, including cost management, project resolution, and delivery of on-quality product cost reserves. Used Records Management System (RMS) to search for compliance documentation. Reviewed all written directives for compliance of accreditation standards. Assured the compliance with local, state and federal regulations and compliance is consistent throughout. Managed the Virginia Law Enforcement Professional Standards Commission (VLEPSC) and policy unit. Maintained a master listing of all requested compliance documentation for assigned area of responsibility. Served on the interview panel for police recruits. Served as a proctor for police sergeant assessment testing. Developed and maintenance of general and operations orders and executive orders(policies). Coordinated with other agencies with policy request (liaison) and/or research projects, etc. Conducted research, analysis and evaluation (best practices) as needed. 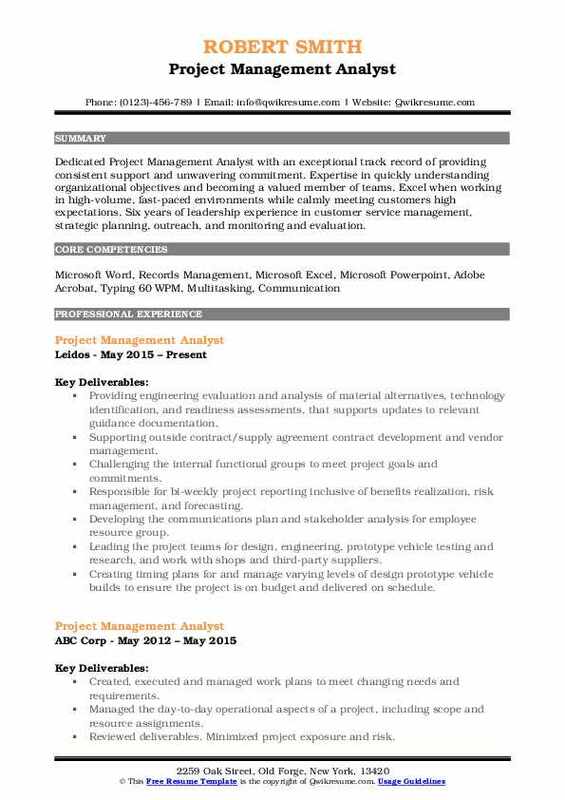 Headline : An experienced Project Management Analyst with strong skills in project management, financial systems analysis, all phases of the software development lifecycle, and cross-team partnership. Proficient in leadership execution of the task and task monitoring, as well as using project management tools to implement project plans into workable schedules for project teams and clients. Self-starter with a proven ability to manage multiple, diverse projects and meet challenging deadlines. Created a business case for deploying a shared service indirect procurement operating model for Latin America. Co-led a sourcing and procurement team kaizen event to achieve a 40% reduction in meetings. Implemented a new governance structure to drive better communication and capture efficiencies from Kaizen. Created executive presentation and training materials for GBS invoice submission process and procurement OPS. Partnered with the programs directors and GBS staff on VOC and employee global recognition projects. Developed reward and recognition program to promote ongoing continuous improvement. Coordinated with work stream leads and the PMO to manage work plan, budget, and business case. Monitored and reported progress of team against milestones, managed the raid log and assured timely completion of action items, performed contingency planning. Summary : Project Management Analyst with more than 15 years of project management experience in financial performance, with strong analytical skills and ability to maintain composure under pressure. Plan for excellent performance, and recognized by the customer on many occasions for superior reliability and responses to needs. Strong project and organizational management skills. Supporting a $4.3 million task executing support and oversight of administrative and logistics personnel responsible for a chemical agent destruction facility. Experienced in handling personnel actions dealing with conflict, disciplinary actions, reporting progress, and addressing concerns. Proficient with experience in conducting evaluations, organizing, analyzing data, problem-solving, review and preparation of procedures and conducting audits (internal and external) among programs, systems, and functions. Demonstrating the ability to handle multiple assignments in high-pressure situations and consistently meet tight deadline schedules. Overseeing and performing activities that involve generating correspondence, expediting work, quality management, customer service, resource scheduling, budgeting, contracts, computer skills, oral and written communication, and presentation. Responsible for the development and review of certain procedures and plans such as the task management plan, procurement/financial plans and various others. Responsible for developing and presenting various presentations at leadership conferences as well as answering inquiries regarding field office processes. 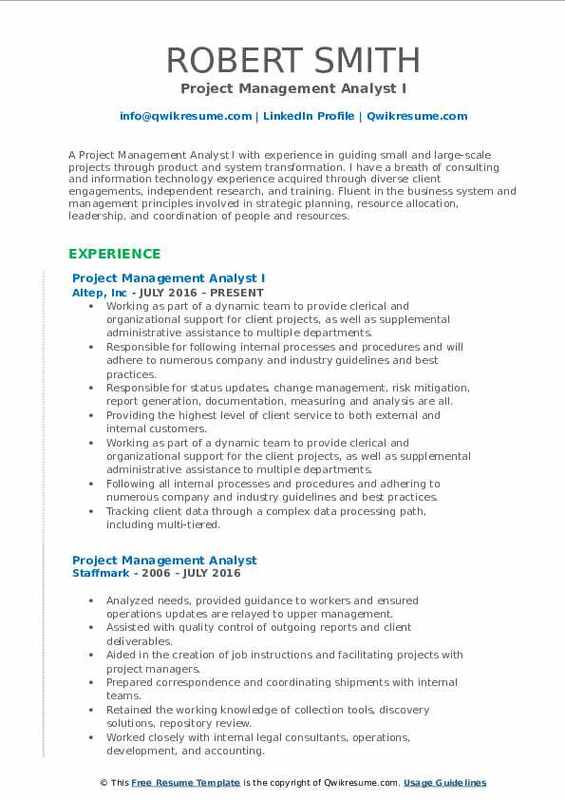 Summary : A Project Management Analyst I with experience in guiding small and large-scale projects through product and system transformation. I have a breath of consulting and information technology experience acquired through diverse client engagements, independent research, and training. Fluent in the business system and management principles involved in strategic planning, resource allocation, leadership, and coordination of people and resources. Skills : Microsoft Office Access, Excel, Word, Powerpoint, And Project. Adobe Acrobat, Quicken, And Some Visual Basic And Web Design Experience. Working as part of a dynamic team to provide clerical and organizational support for client projects, as well as supplemental administrative assistance to multiple departments. Responsible for following internal processes and procedures and will adhere to numerous company and industry guidelines and best practices. Responsible for status updates, change management, risk mitigation, report generation, documentation, measuring and analysis are all. Providing the highest level of client service to both external and internal customers. Working as part of a dynamic team to provide clerical and organizational support for the client projects, as well as supplemental administrative assistance to multiple departments. Following all internal processes and procedures and adhering to numerous company and industry guidelines and best practices. Tracking client data through a complex data processing path, including multi-tiered. Uploading and downloading client data from internal and external servers. Summary : Project Management Analyst experienced in interfacing with multiple business units to coordinate and support projects and initiatives. Facilitating cross-departmental collaboration often involving technical experts and vendor stakeholders. Seeks value creation through process optimization and integration of new technology. Makes complex technical and analytical information accessible when communicating with leadership. Known for analytical and problem solving abilities. Working with the client State Farm Insurance Corporation providing project management support. Developing project work schedule using work schedule standards which can be effectively used for management of the work using primavera p6 to support the ICP platform. Conducting weekly schedule maintenance running global change, pull back dates, manage resource allocation and adjust project budget. Managing cross-project dependencies across multiple programs within state farm to support the ICP platform and ensure dates are met and issues resolved in Lotus Notes. Defining the procedures for the collection of team status and analysis of projects progress, including any metrics reporting and resource forecasting. Updating the work schedule with periodic status updates collected from the team. Analyzing the updated schedule, emphasizing items such as critical path, slipped tasks and upcoming tasks. Calculating, analyzing and presenting the metric reports, such as EVA and burn rate analysis to appropriate parties. 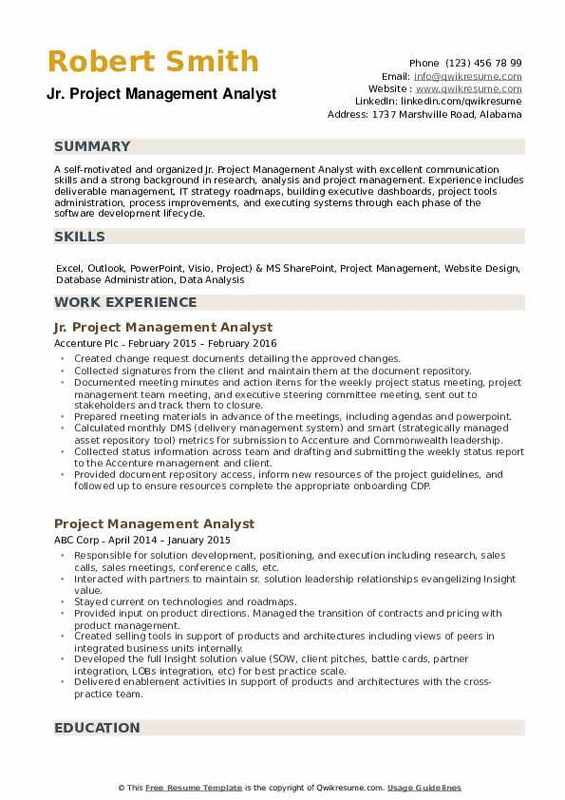 Headline : Strategic thinking Project Management Analyst with six year of project management experience; and three years experience interning and volunteering for a number of companies gaining knowledge. Dedicated and enthusiastic about relationship building with colleagues and enhance my professional career. Experience in IT project management for public and private sector clients. Strong written and oral communication. Provided cost analysis for department budget to ensure program met schedule and performance. Prioritized and balanced work assignments within the office. Ensured timelines were feasible and shifted workloads as required to ensure all suspensions were met. Collaborated with customers and scheduled/facilitated meetings when needed to address and resolve any issues or problems. Analyzed strategic policy issues to evaluate and identify any inconsistencies in current and proposed missions. Identified opportunities to reduce cost while still maintaining high-quality customer service. Prepared presentation and briefed PDM on recommendations. Reviewed Statements of Work (SOW) to ensure contractors were performing within the scope of the contract. Reported any findings on performance or schedule to the Deputy Product Manager. Objective : Certified Associate in Project Management (CAPM) with a track record of accomplishments in developing and executing advisory projects that improve the investment climate, strengthen legal framework and stimulate business development. Persuasive communicator with a high focus on client relations and is successful in supporting senior management in negotiations and project implementation. Strong ability to work independently, or with a team, to consistently achieve excellent results. Assisted in the development and implementation of a strategic program involving various stakeholders in order to identify regulatory and administrative bottlenecks and streamline trade procedures by reducing documentation, time and cost required to trade. Generated detailed process mappings of import, export and transit procedures using MS Visio in order to identify legal and procedural gaps in the administration. Prepared and gave project presentations and status updates, managed ad hoc projects. Managed border crossing study in which I measured the project impact on regional trade flows by collecting, analyzing and interpreting relevant data based on pre-specified trade indicators from 20 top exporting companies. Drafted the Albania country report by measuring the variance of the new trade indicators retrieved from the border crossing study against the baseline and ultimately provided recommendations for further process improvement and cost reduction. Facilitated the upgrade of the customs IT system in order to streamline procedures in conformance with the best practices. Coordinated activities and communication with stakeholders, various world bank group divisions, and regional project teams. 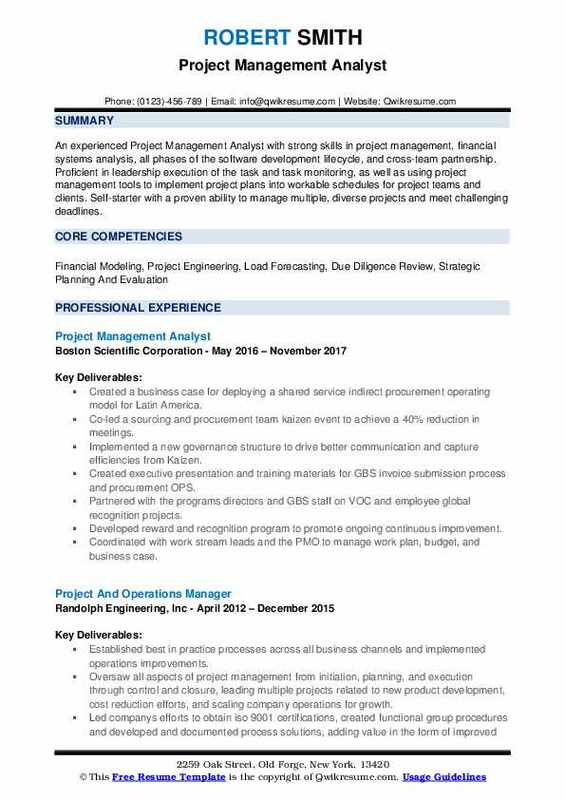 Headline : Dedicated Project Management Analyst with an exceptional track record of providing consistent support and unwavering commitment. Expertise in quickly understanding organizational objectives and becoming a valued member of teams. Excel when working in high-volume, fast-paced environments while calmly meeting customers high expectations. Six years of leadership experience in customer service management, strategic planning, outreach, and monitoring and evaluation. Providing engineering evaluation and analysis of material alternatives, technology identification, and readiness assessments, that supports updates to relevant guidance documentation. Supporting outside contract/supply agreement contract development and vendor management. Challenging the internal functional groups to meet project goals and commitments. 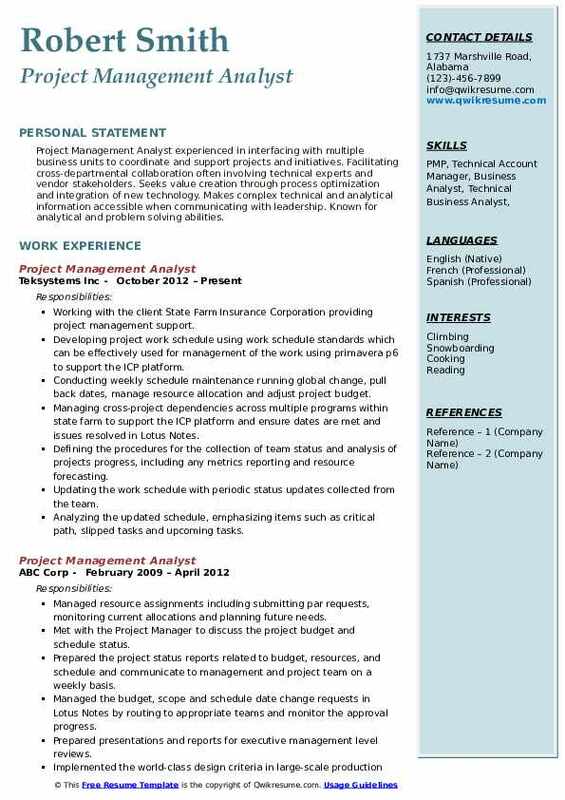 Responsible for bi-weekly project reporting inclusive of benefits realization, risk management, and forecasting. Developing the communications plan and stakeholder analysis for employee resource group. Leading the project teams for design, engineering, prototype vehicle testing and research, and work with shops and third-party suppliers. Creating timing plans for and manage varying levels of design prototype vehicle builds to ensure the project is on budget and delivered on schedule. Summary : Well- organized, detail-oriented Project Management - Analyst responsible for numerous duties along the strategic project life cycle using excellent analytical, problem-solving and organizational skills. Experienced in coordinating diverse teams and resources to complete objectives in a fast-paced environment under aggressive time-lines. Competency in data analysis/tools, application of the principles of systems engineering and engineering management, and basic web development. Led the information technology development team in the conversion of Microsoft SSIS (SQL server integration services) 2008 version to the most recent 2016 version. Utilized Microsoft Sharepoint tool to share, organize and collaborate the data with the team. Effectively communicated with resources involved throughout the project via weekly meetings and ad hoc meetings, completing the project ahead of target completion date. Responsible for managing the resources for the web design of a newly created educational reimbursement workflow while working side by side with the human capital management department to determine reimbursement limits and guidelines. Guided the conversion of multiple international HCM and financial services applications to workday enterprise software. Worked closely with Deloitte consultants in the integration of multiple third-party vendors. Assisted in the development of the system integration testing tracker utilizing SharePoint to streamline the process. Provided high-level support for the global COO/CFO and member of the senior management team, as well as his 5 direct reports. 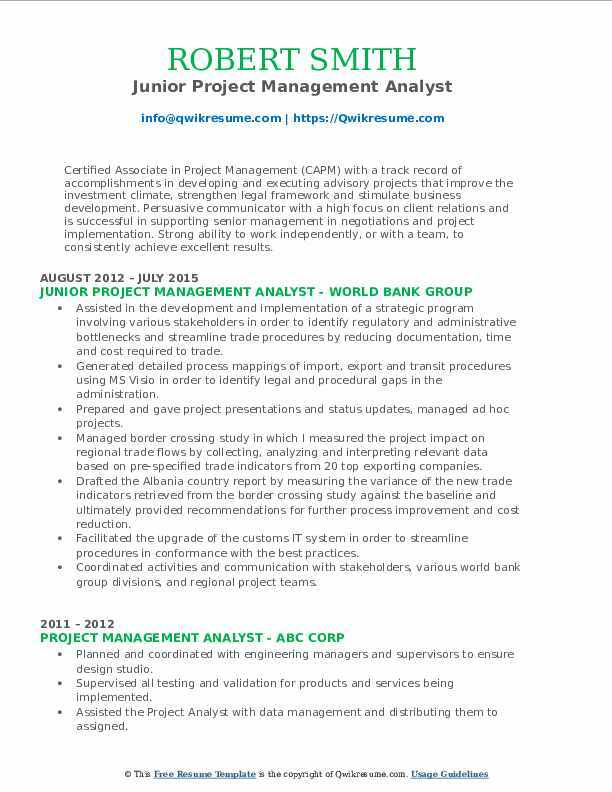 Objective : A self-motivated and organized Jr. Project Management Analyst with excellent communication skills and a strong background in research, analysis and project management. Experience includes deliverable management, IT strategy roadmaps, building executive dashboards, project tools administration, process improvements, and executing systems through each phase of the software development lifecycle. Created change request documents detailing the approved changes. Collected signatures from the client and maintain them at the document repository. Documented meeting minutes and action items for the weekly project status meeting, project management team meeting, and executive steering committee meeting, sent out to stakeholders and track them to closure. Prepared meeting materials in advance of the meetings, including agendas and powerpoint. Calculated monthly DMS (delivery management system) and smart (strategically managed asset repository tool) metrics for submission to Accenture and Commonwealth leadership. Collected status information across team and drafting and submitting the weekly status report to the Accenture management and client. Provided document repository access, inform new resources of the project guidelines, and followed up to ensure resources complete the appropriate onboarding CDP. Updated change requests, risks, issues, and action item logs in the respective repositories based.